I'm so gratified that so many people are making Log Cabin Triangle (LCT) blocks for Quilts of Valor! 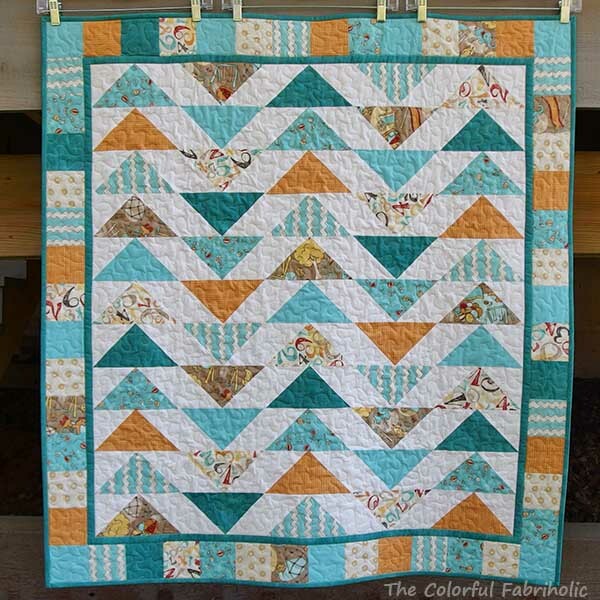 Alycia of Alycia Quilts is holding a block drive for QOV blocks using my Log Cabin Triangle block. 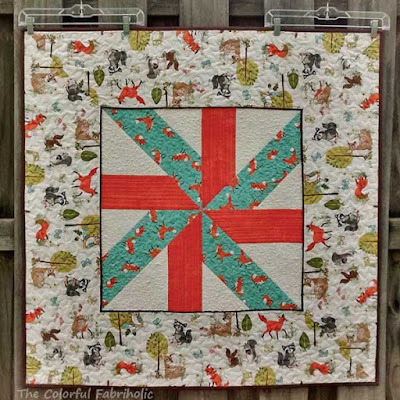 Dar of Dar's Patchwork Garden is heading up the local eastern Missouri effort. They're already receiving lots of blocks, and even finished tops! I donated the block pattern and I'm so pleased that so many people are participating! In addition to the top I've already made, I've made a few more blocks. They're easy and kind of addictive. Plus, they're good for using up low volume scraps. 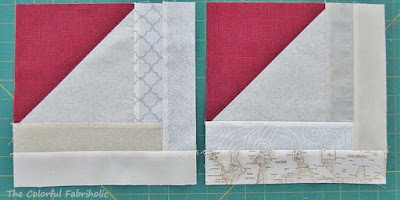 My tutorial has complete instructions for making two-at-a-time blocks. You can also find it on Alycia's blog, with the color positions reversed for a darker and scrappier look. 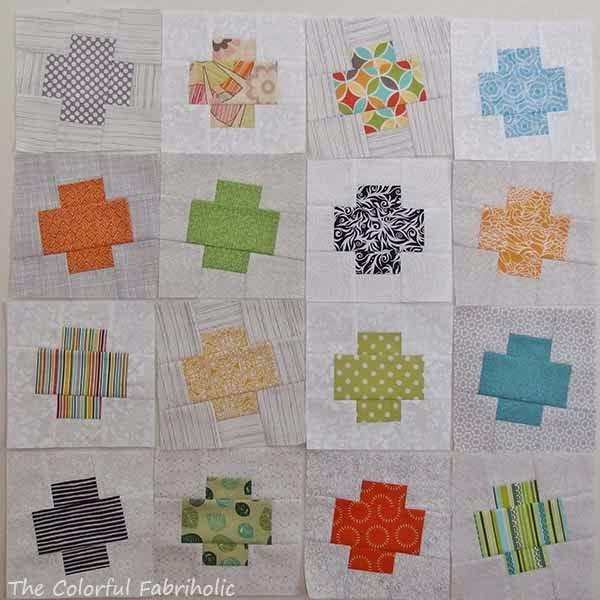 So many layouts are possible with this block! Here's mine, below. It has a modern vibe, with lots of negative space and an alternate grid layout. 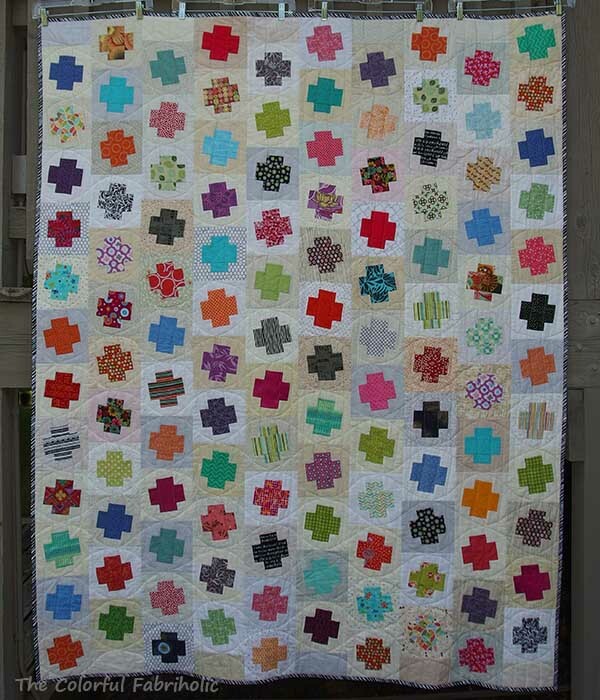 Alycia's version features the bright colors where mine has low volume, and her blocks look bold and scrappy. My Sew Bee It hive mates are making LCT QOV blocks for my turn as queen bee. I'll add theirs to my extra ones and send some to Dar and some to Alycia. I'm currently not aware of other regional QOV groups participating, but if you know of any, please spread the word. 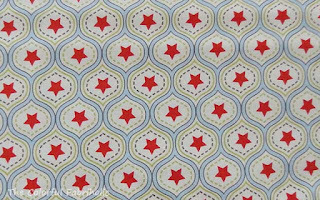 Speaking of spreading the word, I'm linking up with Let's Bee Social at Sew Fresh Quilts. 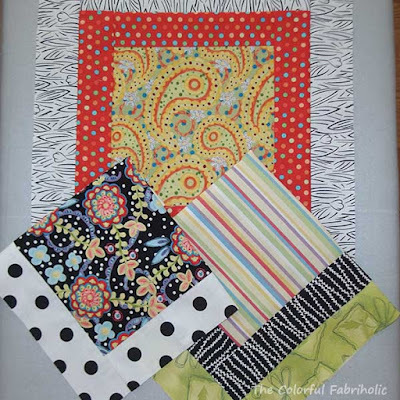 At a guild meeting last week we were talking about "who or what has most influenced your quilting." Many people mentioned their mother or grandmother, a lot mentioned the guild or quilter groups, and a few including me also mentioned blogs. (This is an older group, traditional, mostly not as connected with the on-line quiltiverse.) I am definitely inspired by what I see from the blogs I follow, modern, traditional, in between, or whatever. 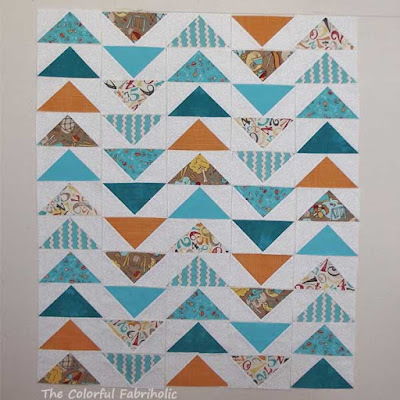 One of the blogs I follow is Wanda over at Exuberant Color. She works in batiks, Kaffe Fasset and similar prints, and hand-dyes. Her eye for color and design is unique and well developed, and she shows a lot of in-progress design wall photos where she moves colors or blocks around to get the effect she wants, Her results are amazing. Lush, beautiful, full of color and movement. Her blog is well named. Wanda is currently working on a Bento Box variation. Hmm, could my fabric group work in a Bento Box design? 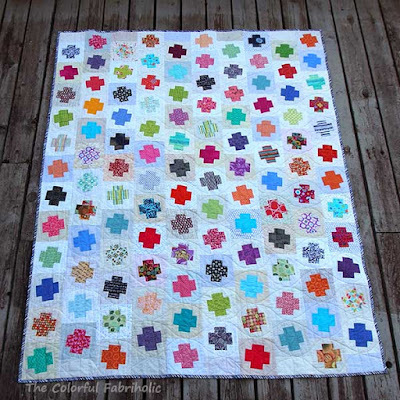 My friend Lois is known for her bold and colorful quilts - a riot of color. She mixes a lot of black & white prints with all her color, too. She says some people tell her they can't look at her quilts, they're so busy & colorful. I love her quilts. They're always so cheerful and energetic! She doesn't have a blog so I can't show you. Anyway, what if I take a page from Lois's book and add some black & white prints to the fabrics I've pulled, and bring in some of the colors from the prints? Let's give this a try. It's only fabric and it's all from stash so I might as well use it. I'll need some starter blocks that read mostly light, and some that read mostly dark. Here are the light ones. Now for some dark ones. Here they are in work, ready for the outside rounds to be added. I have no idea where I'm going with this, no particular size or recipient in mind. I'll finish the dark starter blocks, then figure it out from there. I'm sure someone or something will influence or inspire me. I want to send a big thank you to all the bloggers who share their work. Thank you for all the inspiration and for opening my eyes to all the possibilities for design. Thank you for the effort you put into blogging so others can see what you're creating. Thanks also for the entertainment as I sip my coffee each morning! A finish this week, so I get to count the fabric out! IN this week, 1/2 yard of teal Grunge for binding, most of which has already been used. 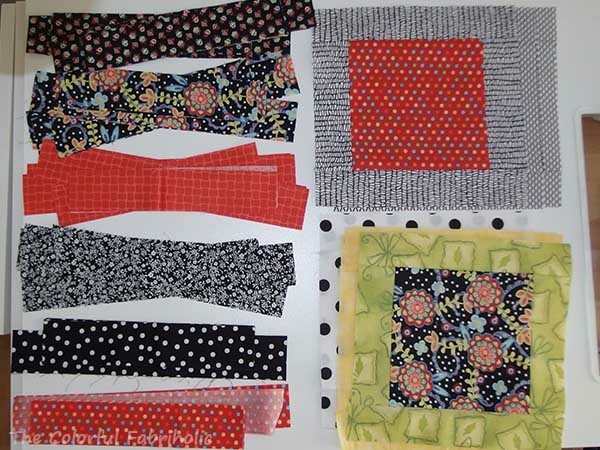 OUT this week, 5-3/4 yards (3-1/2 yards for the top, 1-7/8 for the backing, and 3/8 for the binding). 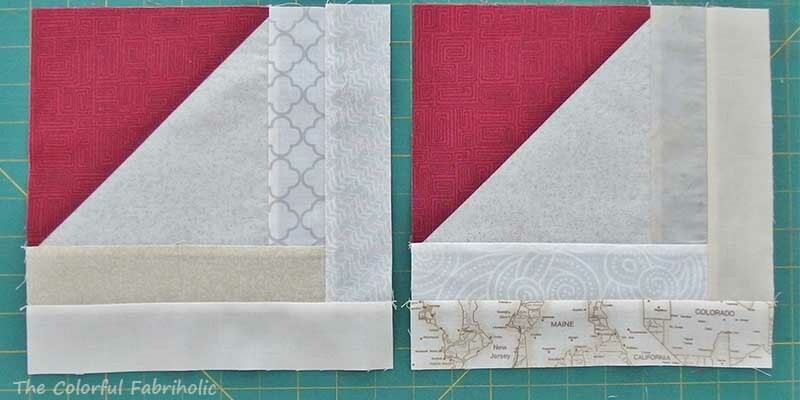 Now that the baby quilt for Andy & Melanie's baby is done, in plenty of time, I can move on to other projects that are calling for my attention. Finished, in plenty of time. These are the mom's colors, so I hope she likes it. 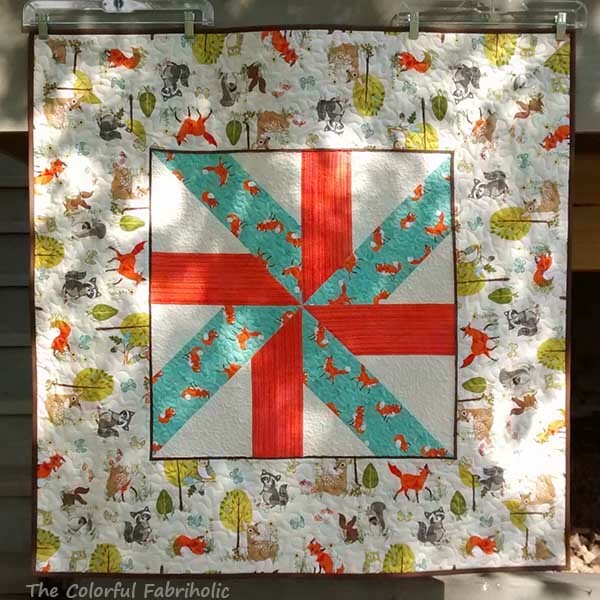 without detracting from the piecing or the prints. The parents are not revealing the baby's name (it's a boy) so I couldn't put the name on the label. I labeled it "Made for Baby with Love from Aunt Jan" and that will have to do. Have you been visiting all the great posts at Blogger's Quilt Festival over at Amy's Creative Side? So many gorgeous quilts! Thanks, Amy, for hosting and for the opportunity to share. Today I'm adding Dancing Plus to the Scrappy category. 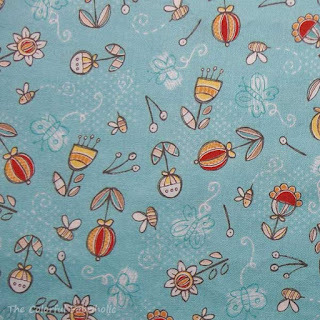 Lots of varied low volume backgrounds here, and lots of cute prints. No particular color scheme except mostly modern-ish prints. 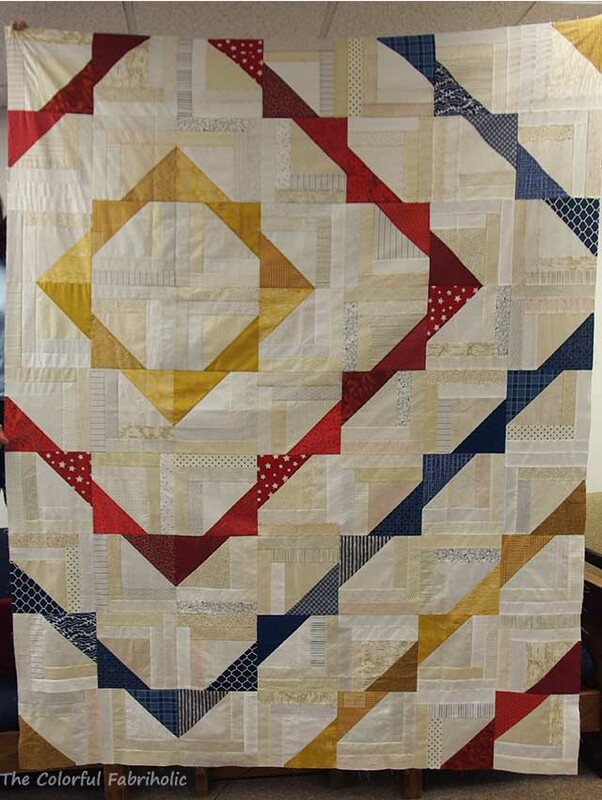 Dancing Plus, 2016, 60" x 75"
Dancing Plus is the result of my Sew Bee It bee blocks. 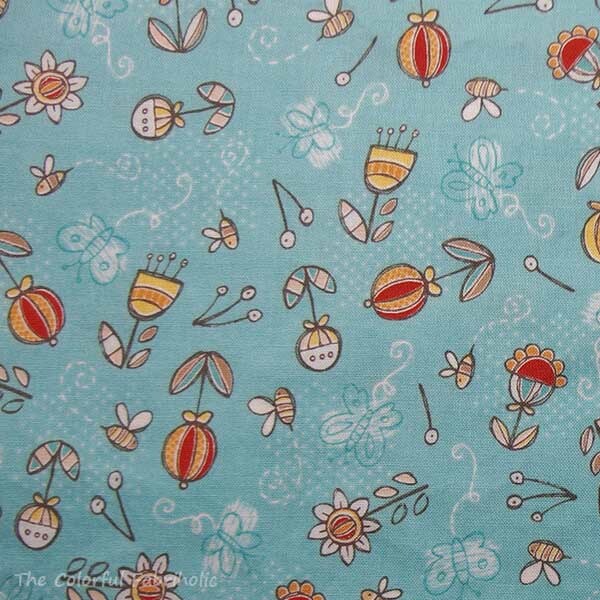 Last year I gave the girls in the bee instructions for the block (tutorial here). They made blocks for me, lots of blocks, and I made a few more, and a few more, and, well, you know how it goes, I got carried away and pretty soon I had enough for the whole quilt. Dancing Plus is destined to become a Christmas gift for a happy family with several kids. It's sofa throw sized, so I'm sure it'll get a lot of use. 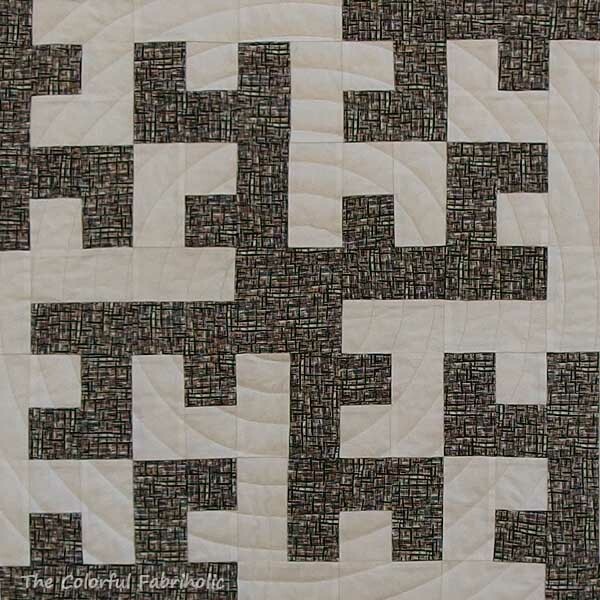 I quilted it with random wavy lines, mostly vertical, with a few curvy diagonal lines between the plusses as well. Very wonky! Sturdy enough to hold up but soft enough to drape nicely. 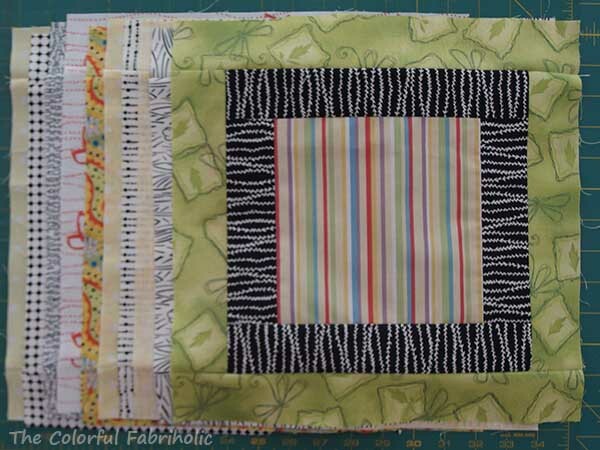 I bound it in a black & white bias stripe print to contain all that busy-ness. 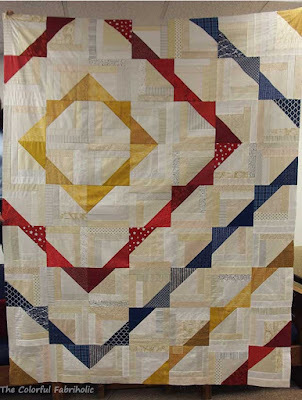 Check out all the other quilty eye-candy at Bloggers Quilt Festival over at Amy's Creative Side. 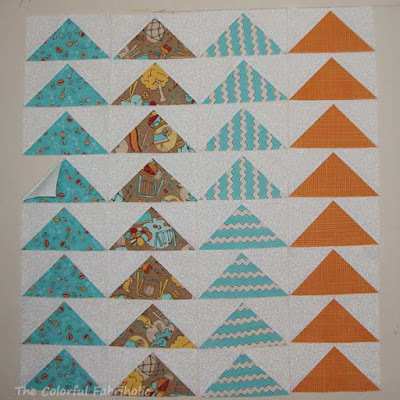 Progress continues on the flying geese baby quilt. 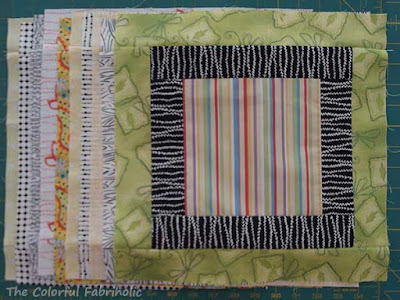 The top is complete, now it's ready to be layered for quilting. Flying Geese Baby Quilt Top, about 42" x 45"
This photo was taken very early this morning with the sun just over the horizon and glowing on the garage door, so the colors look warmer than they are in real life. 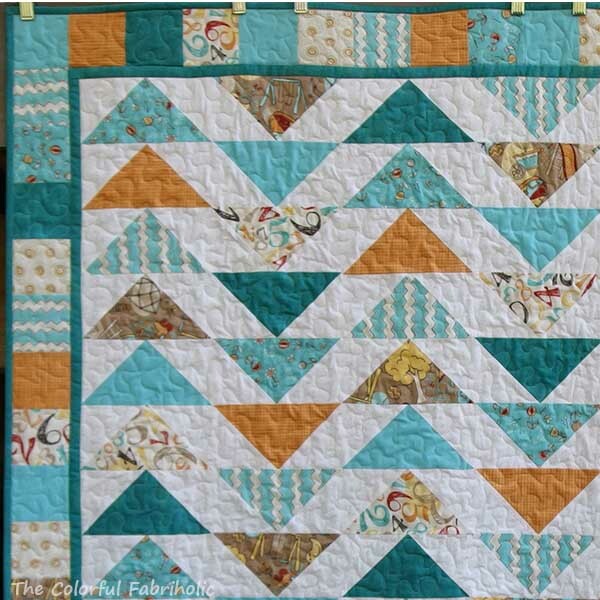 Amy's Creative Side is hosting Blogger's Quilt Festival, in which quilters get to share their best recent work. Blogger's Quilt Festival is taking place this week and next, and includes a category for Original Design. I'm featuring my original design called Antler Dance. 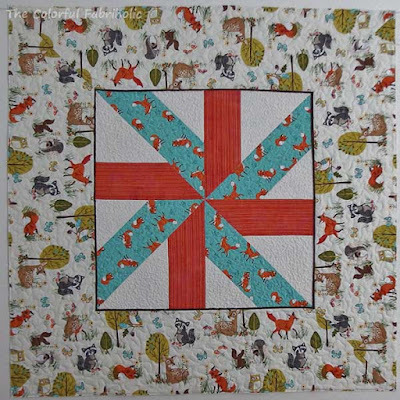 Antler Dance is made using my Cut and Shuffle method (this quilt is not in the book). Although it looks complex, it's actually just one very easy block in a light version and a dark version. 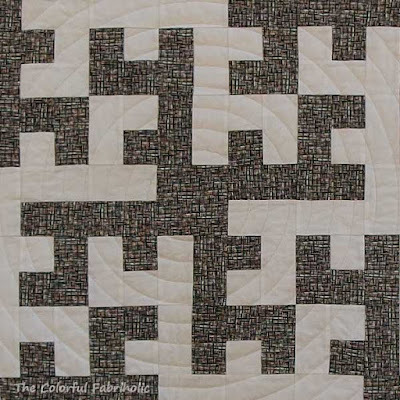 Cut and Shuffle Quilts all start with a simple framed square, which is then sliced and diced. The parts are rearranged to make a nine-patch block. Lots of configurations are possible, and I particularly like the tessellated effect here. Antler Dance was completed in February 2016. Antler Dance, 72" x 72"
Starting in the center, I spiral quilted it using the walking foot, which gives it a bull's eye effect. Antler Dance will be gifted at Christmas to a family where the dad is an avid bow hunter. Very fitting, don't you think?! Be sure to check out all the other quilts in the Blogger's Quilt Festival, and please vote for Antler Dance in the Original Design category, thanks! This link will take you to the BQF main page, and there are links to each category from there. 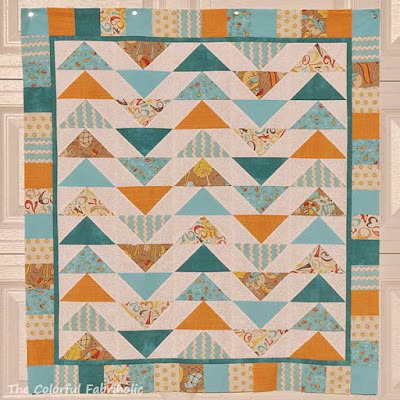 Enjoy all the quilty eye candy! 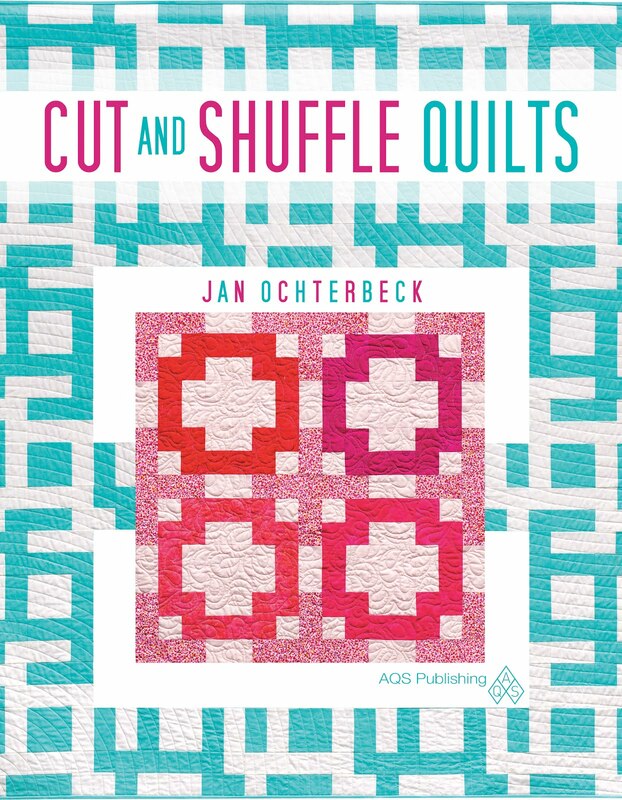 If you're interested in my Cut and Shuffle method and would like to see more quilts made using this method, click on the Cut and Shuffle Quilts tab above. I won a door prize at the STLMQG meeting, 5 FQs of Lotta Jansdotter. They're quite bold, with spots of more than 1" diameter. I don't have a plan for them yet. I did a little shopping, too. The store where I bought my Bernina had a sale on accessories and fabrics. I wanted a specific foot so I bought it while it was on sale. The FQs were 40% off, so a few came home with me. I thought I had a plan for all of them, but only one works, so the rest will go into the stash. Sometimes you just need to freshen the stash, and these are all very usable, so I'm not too concerned about stash additions. In other news, baby Lincoln arrived yesterday, three weeks earlier than expected, so I'm very glad I got his quilt finished last week. I can use only the ones that go in this direction. 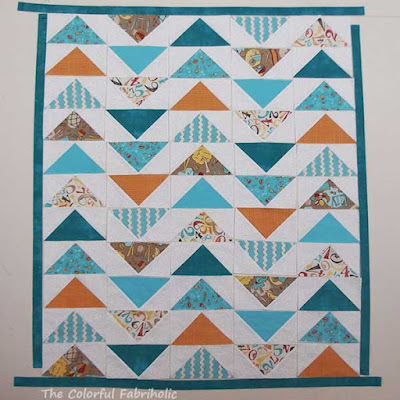 because there will be a narrow teal border. 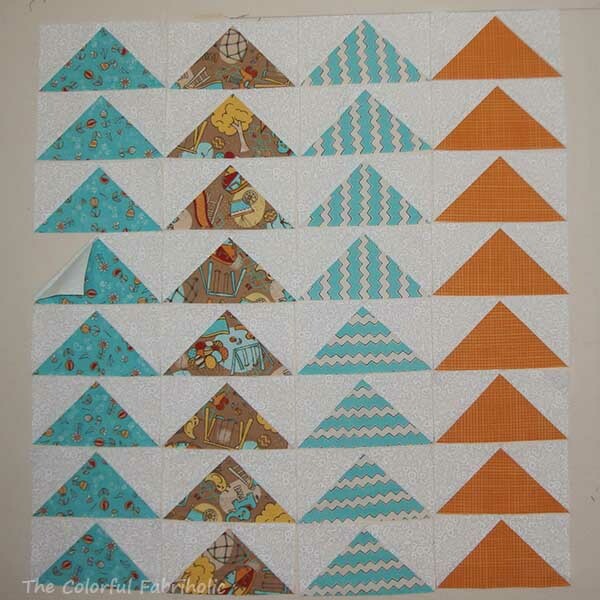 2) Separate the orange and the brown so they're more scattered. 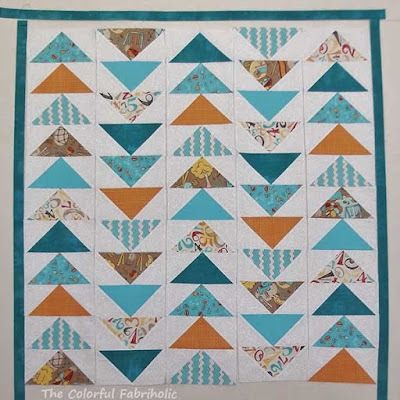 The perfectionist in me is not happy with the crooked chevron geese. 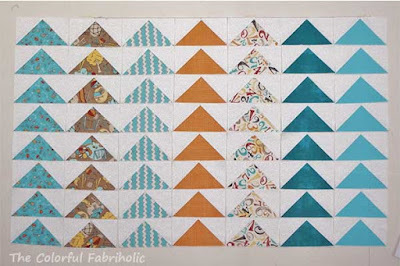 I have enough of the chevron print to make more, so I'll make enough that the stripes can all go in the same direction. I like the vertical ones better. This baby quilt has to be finished for a shower on Oct. 21, so I need to keep at it. I guess I'll be making more flying geese this week. 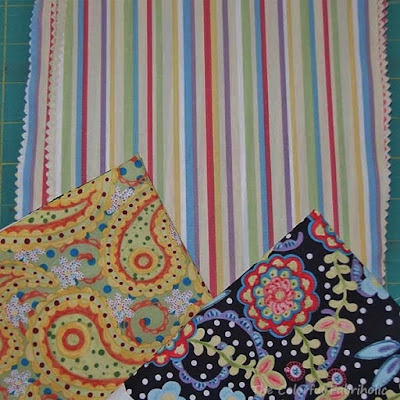 IN: 3 yards, some of which is for the next baby quilt. I ordered some Kona solid, and a couple of other pieces ended up in my cart too. 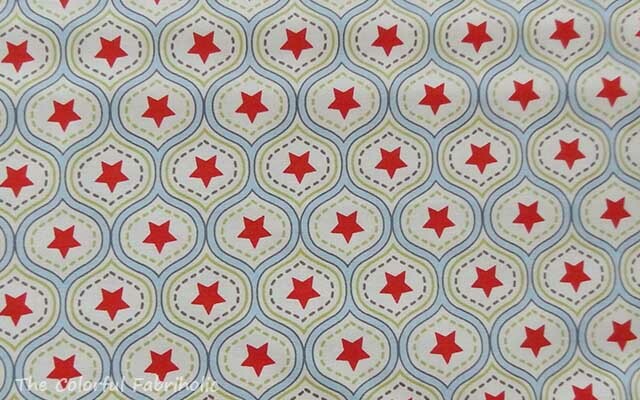 OUT: 5-3/4 yards for the Forest Fellows baby quilt, which includes top, backing, binding, and a bit of waste that was cut away because I matched the print repeat on the top borders. 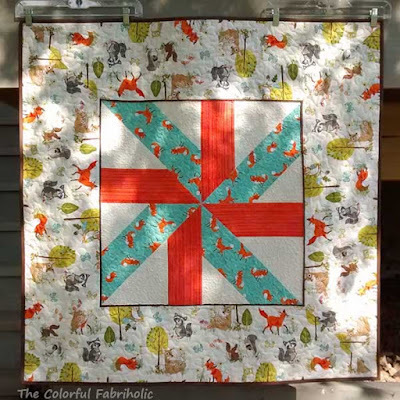 Here's what's up next, another baby quilt. My nephew and his wife are expecting and her shower is scheduled for Oct. 21 so I need to get going on this. The first five prints are from an older line that may have been called Playground, maker unknown. 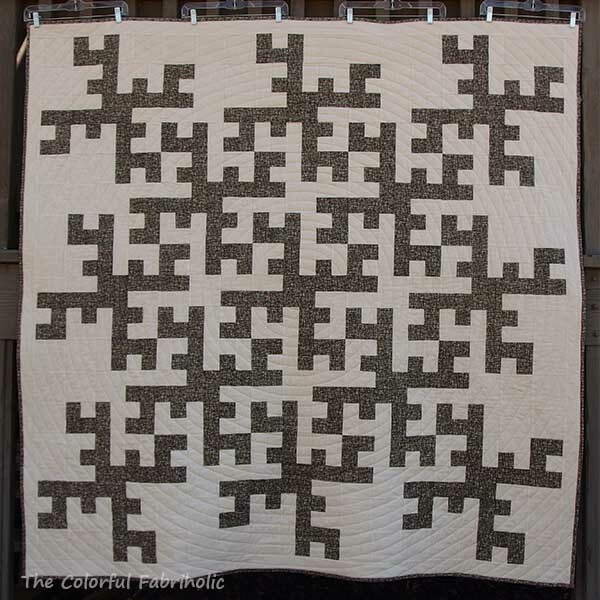 I won a bundle at guild a couple years ago, and based on the cuts in the bundle, I think it was a kit but there was no pattern. There is only a small piece of the focus print and one of the others, so I'm carefully planning how to use them. For scale, the pieces above are 8-1/4" squares. I added teal Grunge to the palette; I like a darker shade in the mix for a bit of contrast. 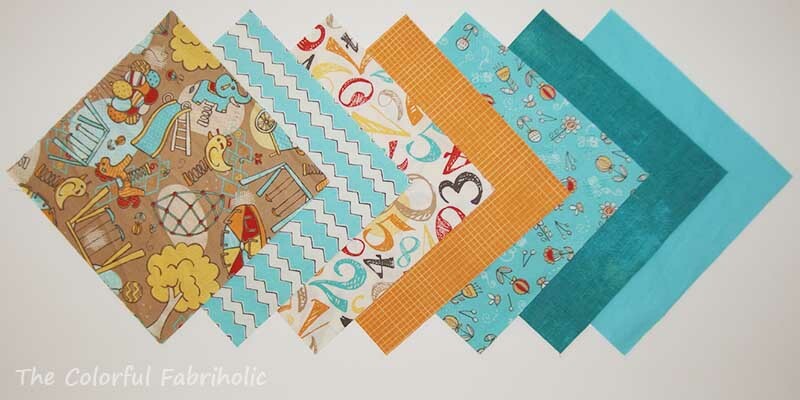 And I added Kona Bahama Blue, perfect match to the collection prints, enough for the top, border, and backing. 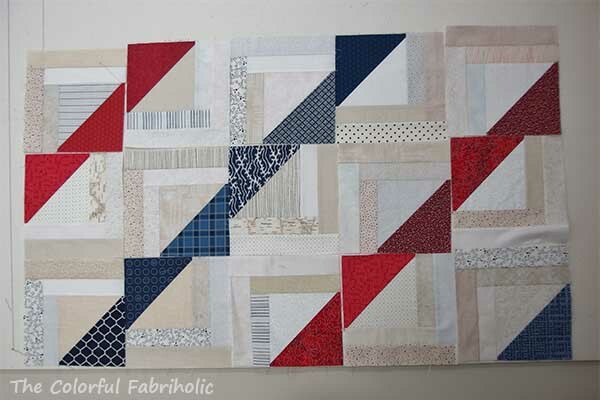 Background for the pieced blocks will be a white-on-white from my stash which features numbers. The baby is a boy. Do you think the floral in the collection is OK to use or is it too girly? 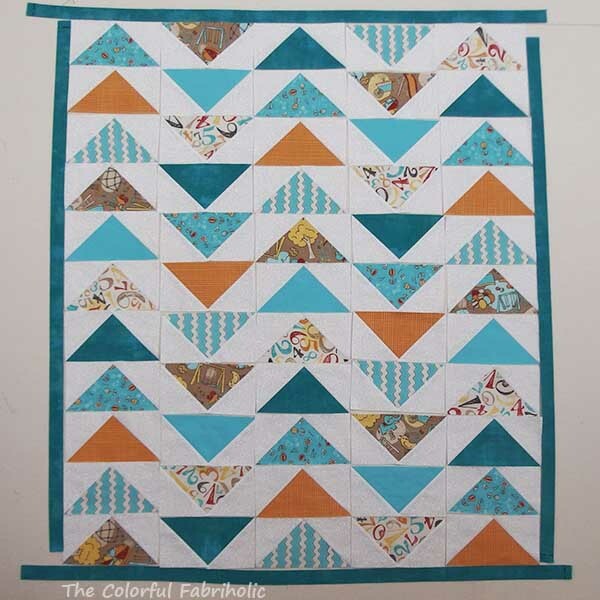 The pattern will feature large flying geese and there will be eight geese of each fabric. I'd like to include the floral because I want the variety of prints, but if it's too girly I'll leave it out and find something else. What do you think? So last week I left off with the quilting done and the batting trimmed away, but no binding yet because I wanted to verify the baby's name, print the label, and insert the label in the binding. The wind was helping while I was trying to take photos. So was the sun. 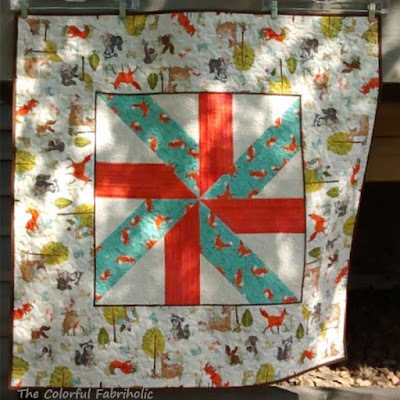 We had some tree damage in a storm last month, lost about a third of the big locust that shades our back yard, so now the sun is dappled in my best quilt photo spot. OK, this quilt is small enough, let's try the fence in the deep shade.... A little gloomy, but photo editing fixed that. 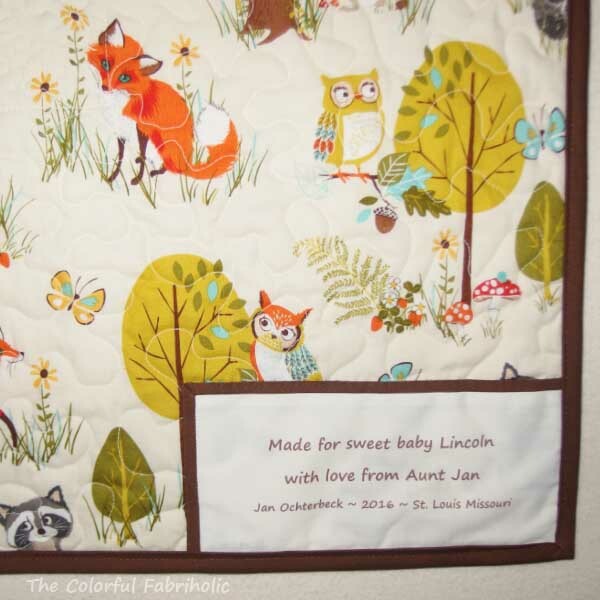 Baby Lincoln is due on October 3rd, so his quilt is ready & waiting for him. It's quilted and ready for binding, but I want to insert the label into a corner of the binding so I only have to hand sew two sides of it. I've been waiting to make the label to verify the baby's name. I was at a party with the parents yesterday, and it's confirmed, the baby's name is Lincoln Richard S___. My goal for this week is to get this quilt completely finished and ready for gifting. Baby Lincoln is due in early October, if mama lasts that long. I draft the label in Word and print it out on EQ Printables* sheets, so it's legible and looks nice. 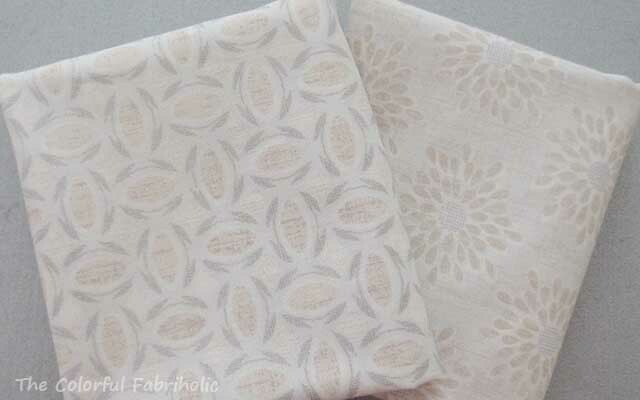 The printable fabric is tightly woven and very tough to hand stitch through. I'll add a softer binding to the two sides of the label that are not embedded in the quilt's binding, to make it easier to stitch the label down. The binding will be completely machine sewn. My hands have flared up again and hand stitching is not working very well for me. Last time they were bad, a physical therapist said I shouldn't hand-sew for more than 20 minutes at a time. I have two baby quilts and 5 large gift quilts to be labeled this fall. Maybe I'll set a goal of doing one a week. Another nephew and his wife are expecting their first baby, due in early December. 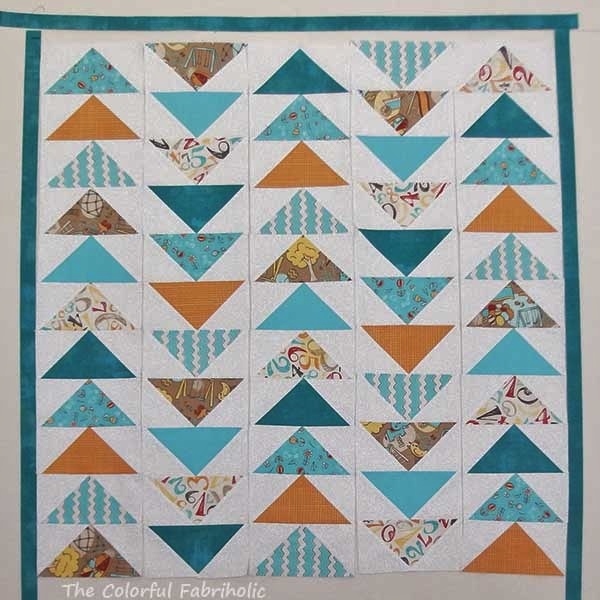 I found out yesterday that the baby shower is scheduled for October 21st, so I need to get busy on the next baby quilt so I can have it done in time. 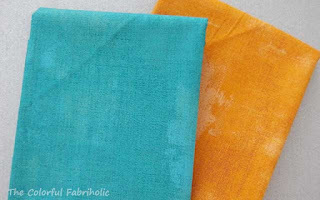 She likes teal and turquoise and that's what they'll decorate the baby's room in, so I'm good with my preliminary fabric choices. I need to supplement the fabrics I have and figure out a pattern that will work. OUT: 7-3/4 yards, used for the LCT QOV top. That's a lot of neutral (low volume) strips! 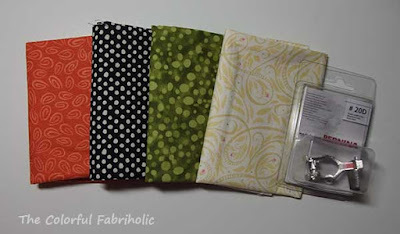 IN: 7-1/2 yards, because I took advantage of a Labor Day sale at a LQS yesterday to get backing for the QOV, replenish some low volumes, and pick up a couple colors of Grunge for some planned projects. Everything was 15% off, even the sale fabrics, so I only spent $43 for all this. The turquoise Grunge is for the next baby quilt. The orange might also be used for the baby quilt, but it's primarily for my STLMQG Crayon Challenge project. 1/2 yard of each, regular price less 15%. And backing for the QOV. I needed 5 yards and there was 5-1/2 yards on the bolt so I took it all. For scale, those stars are about 3/4" in diameter. Sale $4.99 less 15%. I wanted a light backing for the QOV so it wouldn't show through all the light areas of the top. I think the star print will work nicely. Here's the QOV top, (tutorial here) and you can see how it used up a lot of low volume fabrics. So net 1/4 yard out this week, and I'm still doing OK for the year, more out than in. I have some more finishes planned for gift giving this fall, so if I'm careful about purchases, I hope to end the year with a net stash reduction. These blocks and this top were so fun to make, I just have to show it off for a Friday Finish. LCT top for QOV, 63" x 81"
The block is Log Cabin Triangle, and I posted a tutorial for it earlier this week. 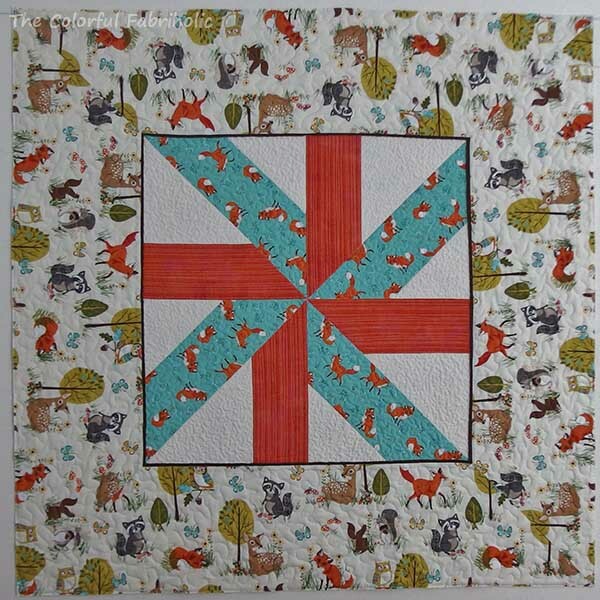 It's the featured block for Alycia's block drive for Quilts of Valor. Check it out, it's easy, and I hope you'll make some blocks. Knowing how much yardage I cut of the colors and going by the EQ estimate of the neutrals, this top used 7-3/4 yards of fabric. I'll admit, there was a lot of cutting. 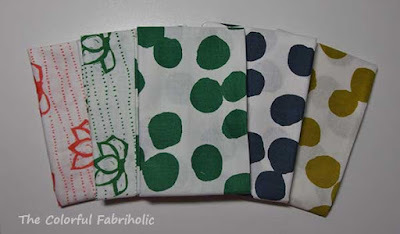 I used strips of just about all the different fabrics in my neutral stash, and completely used up a few fat quarters.